Hey guys, are you enjoying the spring time? I’m so glad it finally got warm around here, I can finally go out and start enjoying the nice weather. 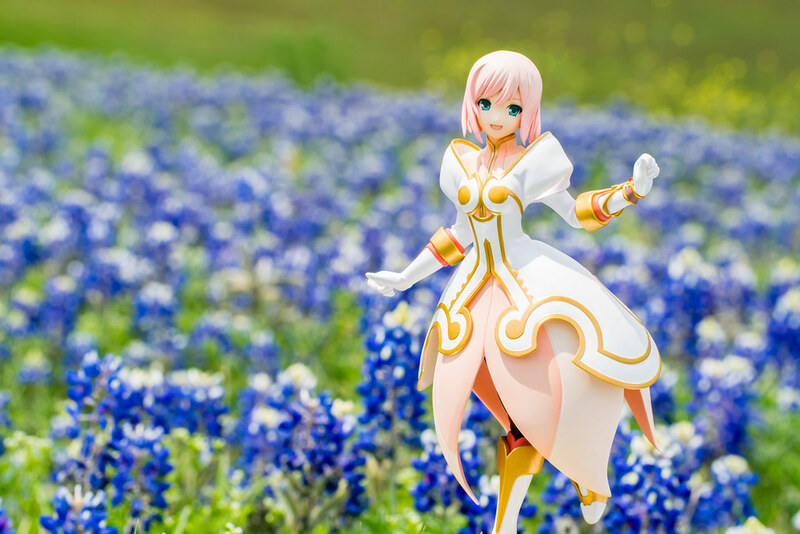 I get to do nice things like go out and snap some pictures among a pretty flower field of the lovely Estellise Sidos Heurassein from Tales of Vesperia released a few months ago or so by Alter. Whenever video game consoles are released it is usually not a particularly good idea to become an early adopter. You end up paying a higher price as new consoles tend to release with a high price point. A price that will inevitably drop as time goes on during its life cycle. The selection of games available at launch tends to be nothing to write home about with an occasional “killer app”. Launch is then followed by a fairly long period where there are not many notable releases and you end up with nothing to play on your fancy new console after the launch period. That’s why I would suggest waiting a year or two let the library of games grow or alternatively wait for that one game you really, really want to play. When the Xbox 360 and PS3 released back in 2005 and 2006 I did not have the purchasing power to drop $500+ to buy either of those. Back then I did not find it too much of a bother as there weren't really any games I wanted to play for either console. I followed my own advise and waited, for the right price, the right game, the right time. Fast forward to 2008 and that had changed for both, on the PS3 I really wanted to play Valkyria Chronicles, enough that I bought the game before I could get my hands on a PS3. On the Xbox 360 side it was Tales of Vesperia, while I would end up waiting another year to buy the slim PS3 I became an owner of a fancy new Xbox 360 on the late summer of 2008. At that point the Xbox 360 had gotten several price drops, after three years since its release the game library had expanded, HDTVs while still pricy where affordable for most of us and I finally had the one game I wanted to play. Thus that late summer marked my introduction to the HD era of gaming. During the previous generation I was introduced to Namco’s “Tales of” series in the form of Tales of Symphonia on the Nintendo Gamecube. That game would end up making a big impact on me as it would end up becoming one the shining gems to play in the often maligned Gamecube with its lack of games. 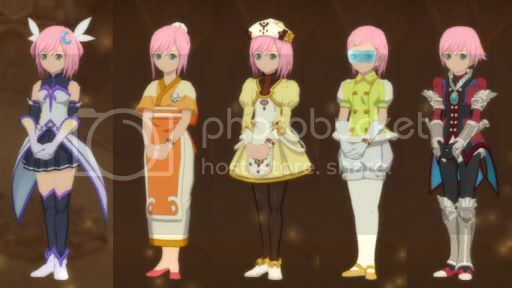 Having skipped on the PS2 Tales iterations, Tales of Vesperia would be my return to the franchise and I was looking forward to playing my way through. I gotta say it was an enjoyable ride; I actually did not end up getting all that much use of my Xbox 360 besides this game and the Mass Effect trilogy. Even so I still find that it was worth it, even if I pretty much just bought it to play Tales of Vesperia I don’t regret it one bit. I enjoyed playing the game, the visual upgrade; its vibrant and colorful presentation was a huge jump from Tales of Symphonia. The further refinement of its variously named acronyms battle system was even more fun. However, what really made me love this game were the characters, perhaps it was finally having voiced skits but I just loved their interactions with each other. Which leads us to the lovely Estellise or as I prefer to call her Estelle as she was nicknamed in the game. 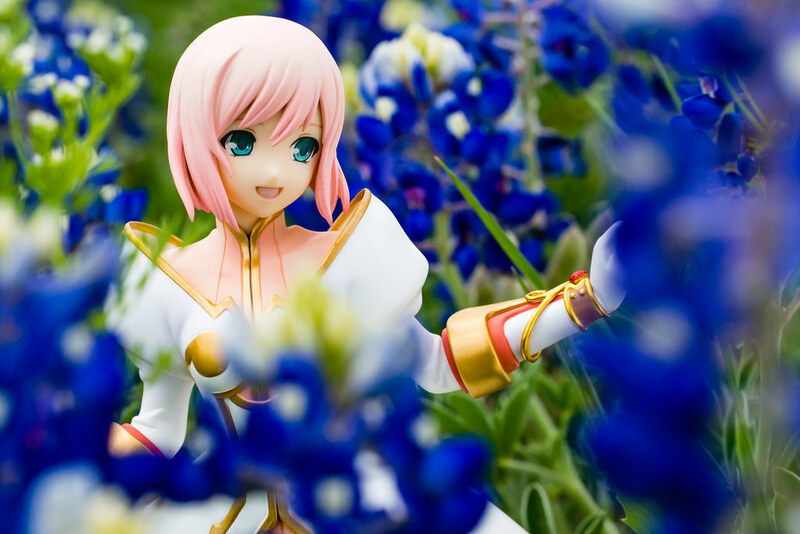 Estelle is the female lead in the game and the first party member that joins up with protagonist Yuri Lowell. She is the lovely archetype of your somewhat naïve, sheltered princess, she is a light attacker and fills the role of the medic for your party. In fact, by the end of the game, I had her dressed up as a bunny eared nurse. Together with the theft of a certain McGuffin early in the game she is the catalyst for setting out Yuri’s journey, the meeting of their companions and the eventual quest to save the world as Tales game tradition dictates. 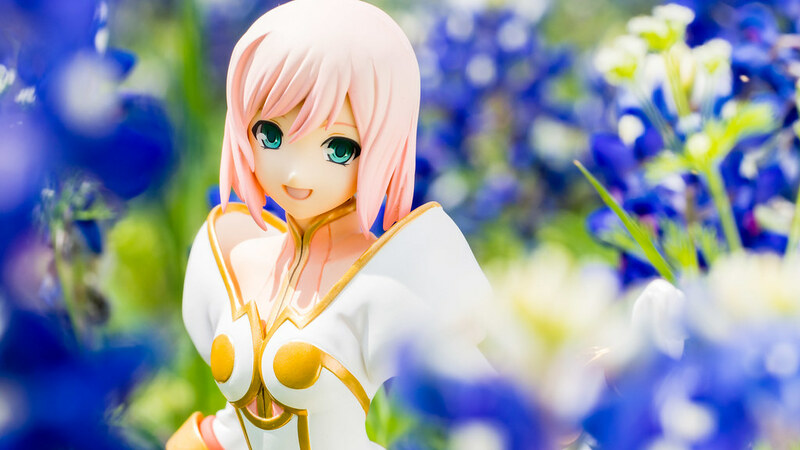 Estelle is a really sweet girl, the type of character that always wants to help out as many people as possible and become friends with everyone. She is the kind that will put others before her trying to hide her own suffering and problems. This is something that ends being quite important during the game’s third act. While not my favorite girl in the game, I like her, I enjoyed her character. 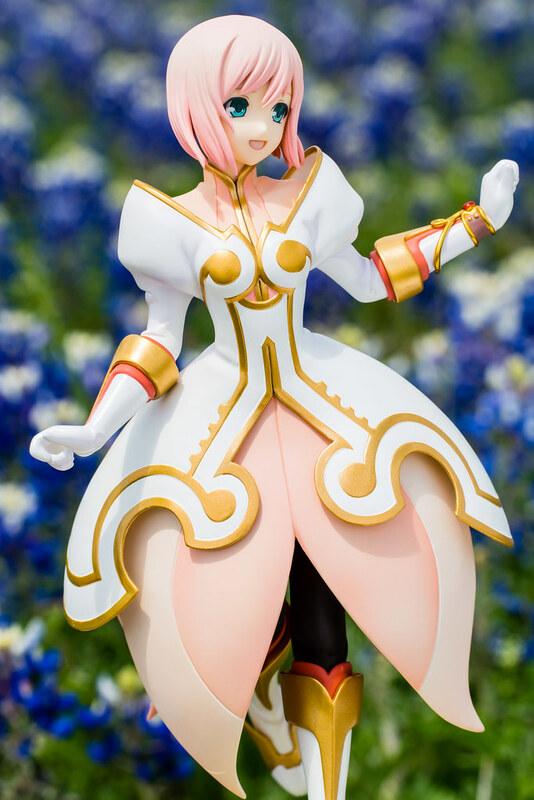 After all I did end buying this rendition of Estelle by Alter. Speaking of which, oh Alter, I think this might be longest wait for anything I ever pre-ordered. From time of pre-order up until release I think I waited over a year may be closer to a year and a half if I’m not mistaken. The joys of figure collecting eh? I haven’t ordered another Alter figure since but it looks like they are back on track and seem to be releasing figures in a more traditional schedule lately. While annoying to wait that long, at least I had very little to fear, after all it is Alter we are taking about. Have they ever released a figure people would call bad? I don’t think I have heard of such things in all my years of figure collecting. Alter did a nice job depicting Estelle as if she is in a running motion, I can definitely feel that nice sense of movement. 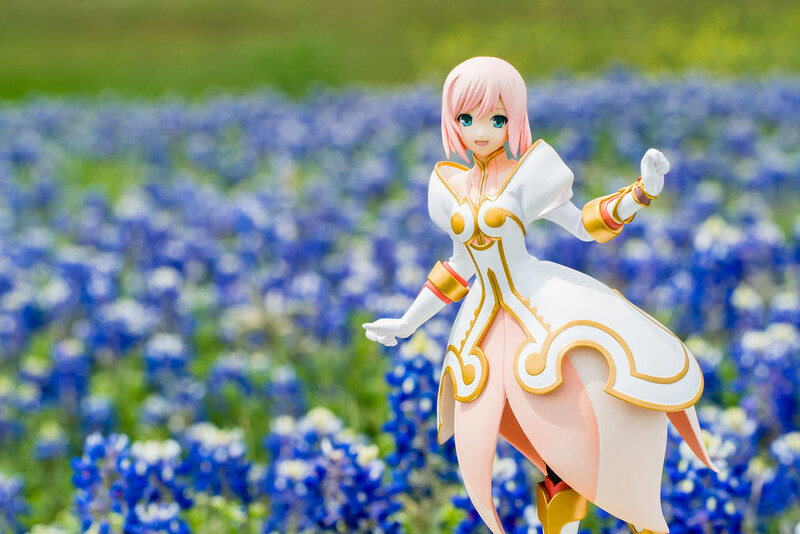 This is just the perfect pose in my opinion to depict her running through a field of flowers. 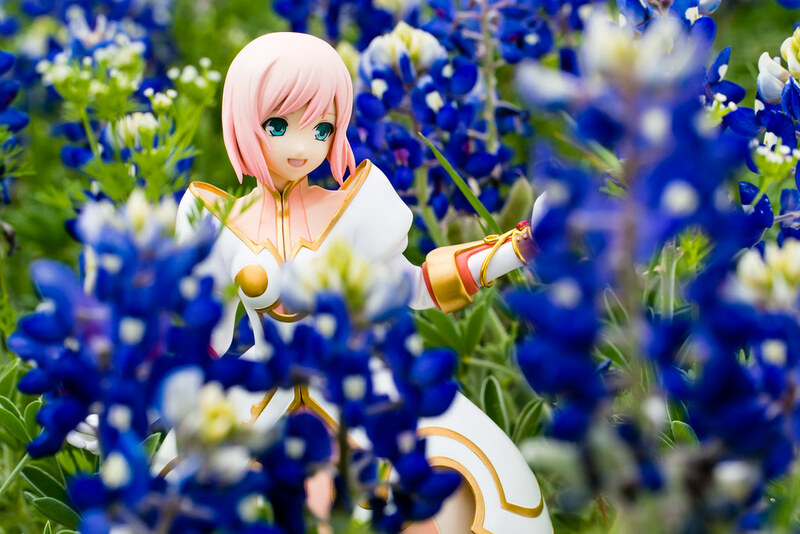 Sometime after I moved a few months ago I noticed this flower field blooming on the side of the road, I knew I just had to take pictures of Estelle there. 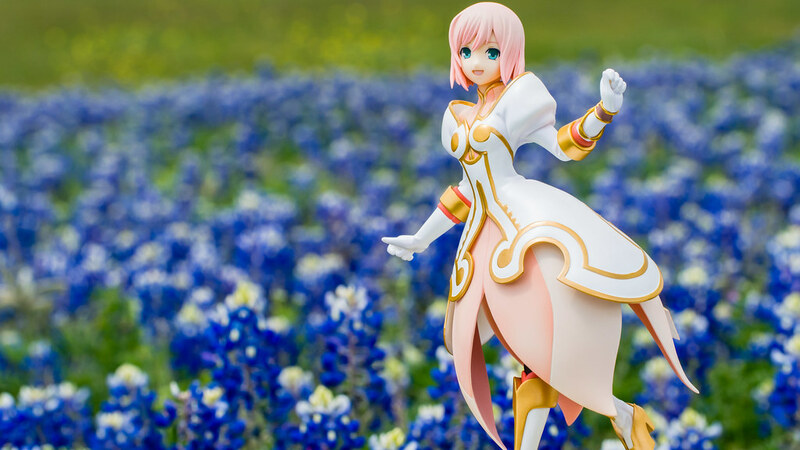 The pose, the field, it reminds me a lot of a scene from the opening of the game depicting Estelle among a field of flowers. I just got this image into my head and I just had to turn it into reality. I’m glad I was able to translate the image in my head into photos, something that might not necessarily go as well as some of my previous attempts with other figures have shown me. 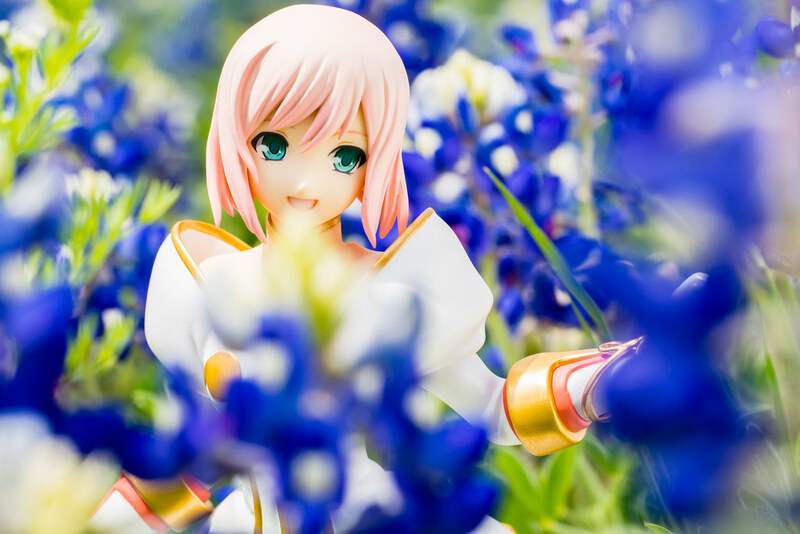 I really like the how the colors turned out, the soft pastel pinks and used for Estelle’s hair and clothes gives her a nice soothing presence. 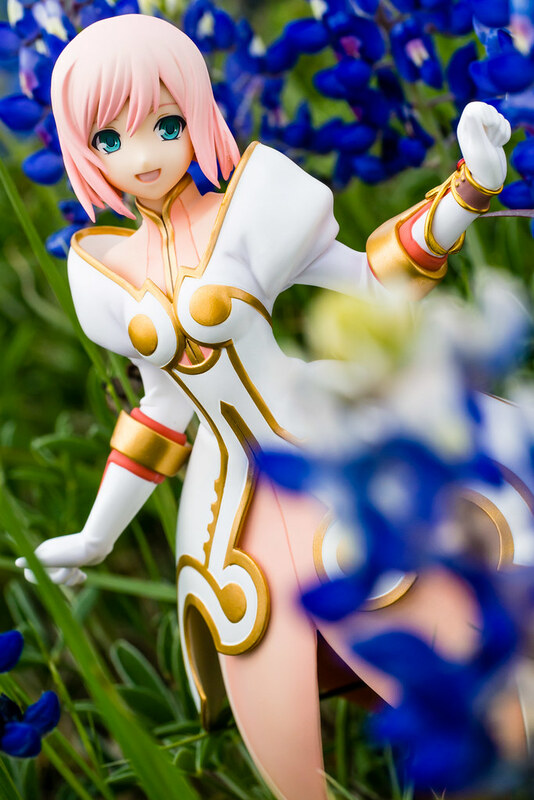 The gold accents do their job and give Estelle the aura of nobility. 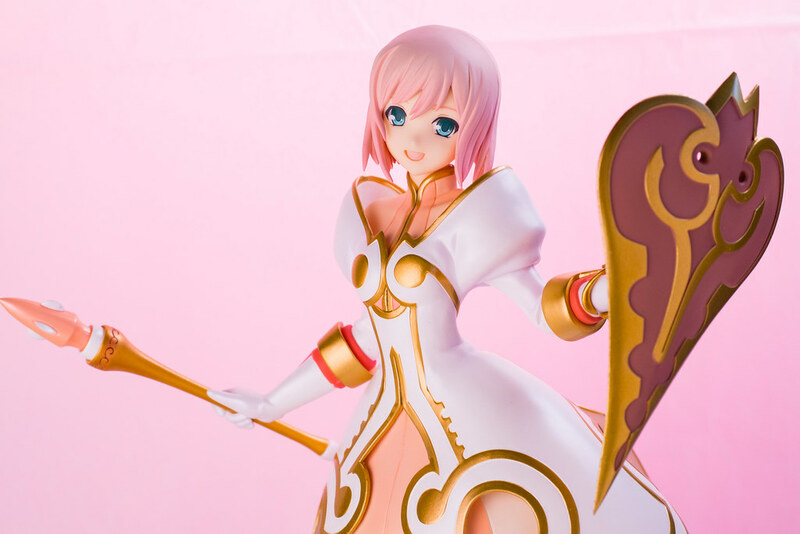 Alter did a nice job translating Kosuke Fujishima’s character design into figure form. Her face and expression are perfect for the character, the nice green in her eyes look good and that smile feels really warm to me. 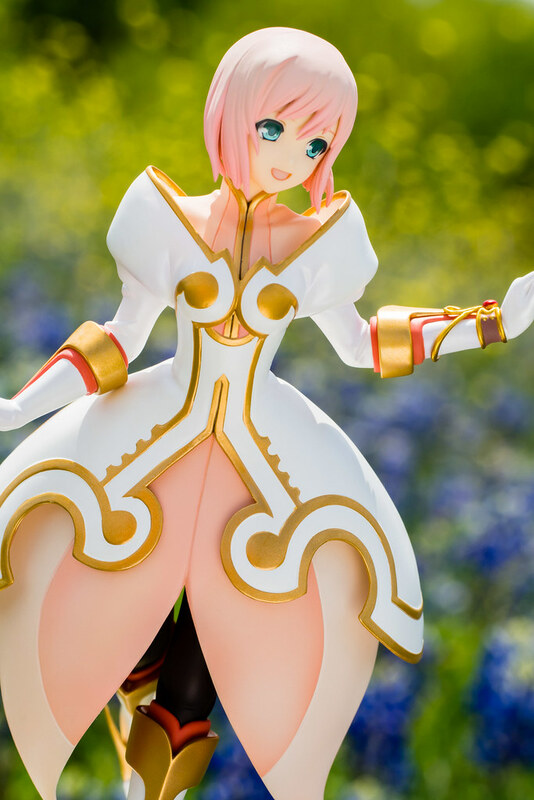 Estelle comes with a few different accessories giving her a couple of different display options. You can choose to display her with her weapons, a mace and a shield. In game she would use maces as seen with this figure as well as light swords like rapiers. The mace splits into two parts allowing it to be inserted into her right hand. The shield on the other hand needs to swap her left hand for another that contains the handle for the shield. Her left hand is simply attached at the wrist to her arm and is easily removed. The handle is attached with a couple of pegs and can be easily interchanged with the hand and handle that can attach to the figure. 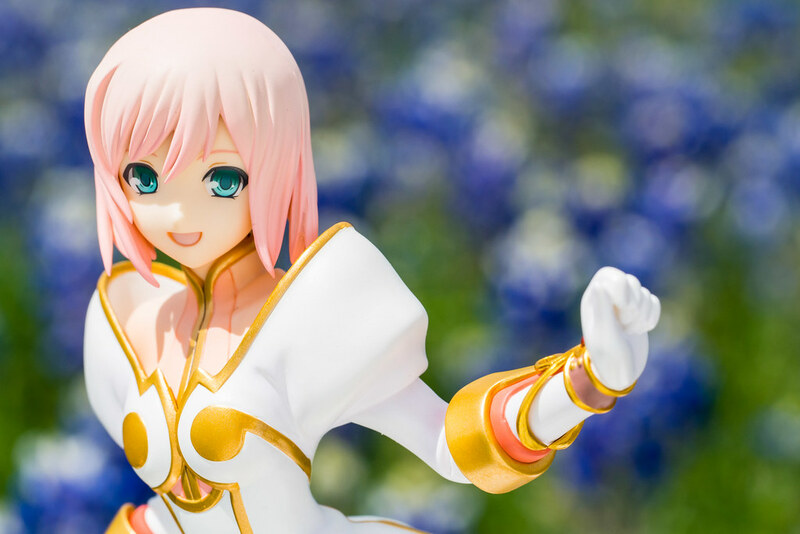 This leads me to my biggest issue with this figure, attached to Estelle’s left wrist is what the game’s jargon calls “blastia”, these come in various shapes and uses in the game. The party characters use theirs for battle, these are what allows them to do all the fancy skills and magic in the game. 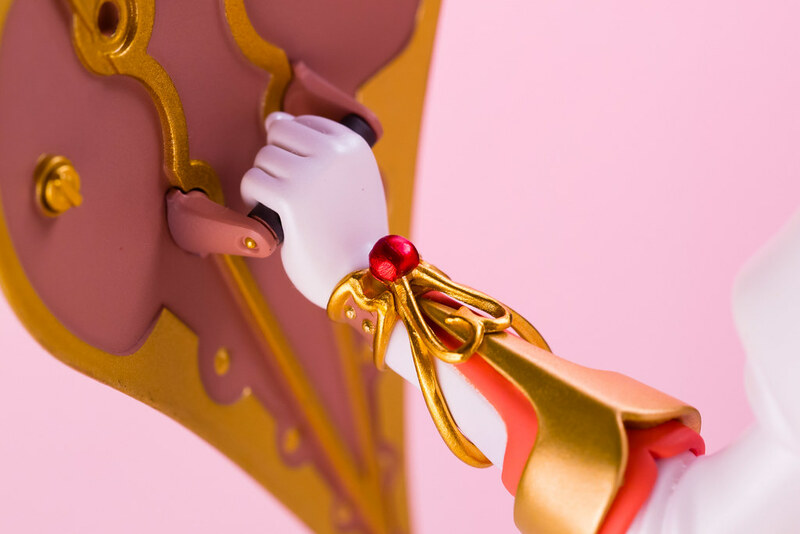 In the case of Estelle it is the shape of bracelet like accessory, for the figure it is attached by a peg on her wrist. This peg fits very loosely, thus causing it to detach and have the red jewel part roll around in the arm. 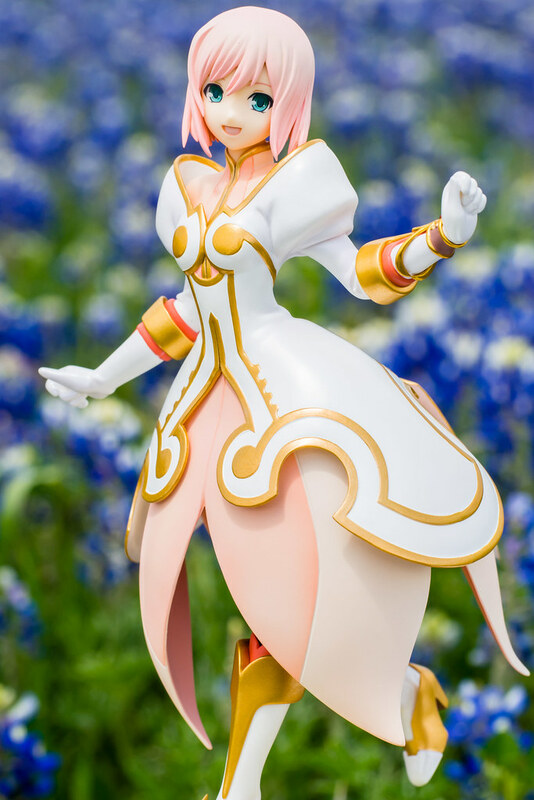 Another extra item that comes not only with Estelle but with all Tales of Vesperia figures from Alter is a super deformed version of each character. These are quite tiny; they simply plug into the base and have limited articulation with their heads. While not overly detailed given their size I still find them a nice perk. Although it does have a few mishaps with her hair, some bits of paint here and there that are not even all that visible to the naked eye anyways, and the blastia on her left arm overall I like the figure. 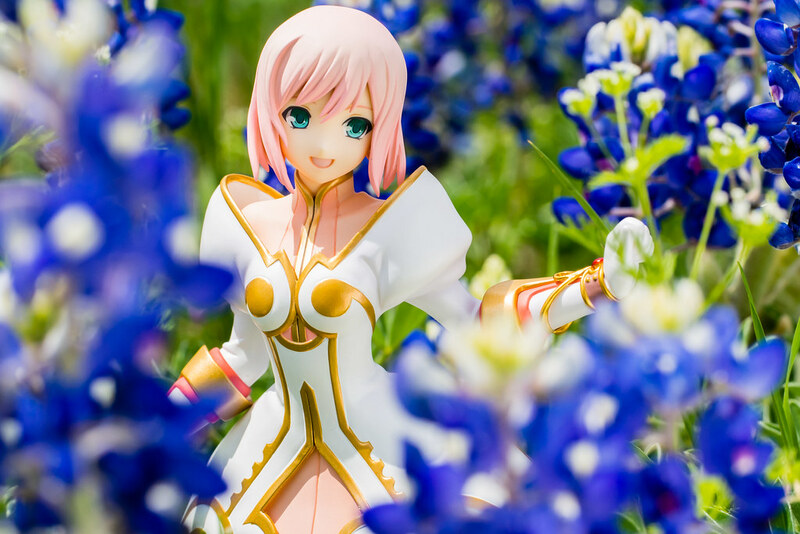 To me it was worth the wait, a very, very long wait as a fan of the game Estelle originates from. While a very nice figure I’m not sure if the wait was worth it if you are not a fan as I am. Alter has made figures for Yuri, Flynn, Rita, Raven and Estelle leaving only Carol and Judy left to get the figure treatment. 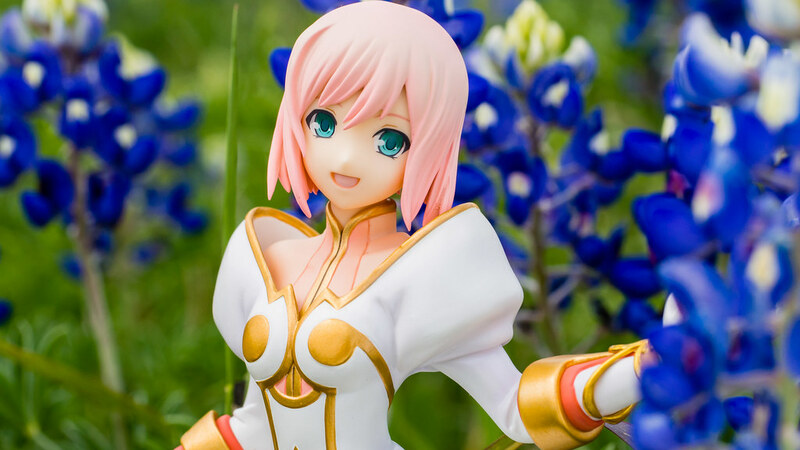 Alter hasn’t announced any more characters from Vesperia but they are still making Tales character figures. I’m hoping Alter hasn’t moved on yet as I would love to get a figure of Judy my favorite girl of the game. Well, I guess I should be happy to have so much Tales goodness at my disposal. Alright peeps, that's all for now, I'll see you around next time!